No longer do you have to spend hundreds of dollars just to get an electric boost to your oral care routine. With the Oral-B Pro 1000, you can get started transitioning from your manual go-to for a more exciting option. While this toothbrush doesn’t have all the features you’ll find with the more expensive options, it does come with a built-in two-minute timer and affordable brush heads. If you have sensitive teeth and gums, you’ll have plenty to gain with the Philips Sonicare Healthy White toothbrush. It comes with three intensity levels so you can brush your teeth without the worry of hurting your mouth in the process. One of the levels even comes with a whitening mode! While a little more expensive, this brush is ideal for those wanting to go electric without any discomfort. Additionally, it’s sonic technology is the fastest vibrating option on the market. Always On the Go? Try This Brush! Electric toothbrushes are fun to use, but traveling with them can be a large burden. Luckily, the Violife Slim Sonic toothbrush combines the best of both worlds for the constant traveler. This battery-operated option comes with a cover so your brush head is protected and easily tucks into any toiletry kit without worry. It’s also one of the cheapest options to offer sonic technology, just like the Philips brush mentioned previously. 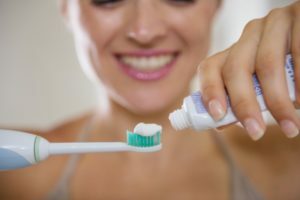 If you want to try an electric toothbrush with as little risk as possible, the low-cost Oral-B Pro-Health Anti-Microbial brush is the way to go! Not only do the shielded bristles help prevent bacterial growth, it also comes in a variety of colors! Making Brushing Fun for Your Child! Of course we couldn’t forget about the young ones who want to make brushing more exciting! The Oral-B Kids Rechargeable toothbrush makes brushing much easier, comes in a variety of colors, comes with stickers, and even pairs with an app to keep your child brushing the recommended time. It also comes with a timer and small handle for easier grip. Not sure which toothbrush is right for you? Schedule an appointment with your dentist in Millburn to see which one would benefit each member of your family! For his commitment to excellent patient care and understanding, Dr. Robert Schick earned the 2015 Patient’s Choice Award for Dentistry in New York. To learn how his expertise in at-home care and preventive dental treatments can help your family, contact him through his website.